Slow cooker apple butter; apple butter recipe made in the slow cooker. Makes 2 pints. It’s slow cooker season! And by ‘season,’ I mean this: I’m going to pull it out of the cabinet and use it exactly two times. I’ll make my Mom’s beef stew and apple butter recipe, and then it goes back into the cabinet to wait for Spring. Truthfully, I’m not the biggest fan of the slow cooker, because, um it kinda makes food all taste the same way. I’ve tried hard to love it. I’m a busy Mama, and I know the slow cooker is my friend–it wants to be my friend. This is the exact crockpot I use. I love it because it’s oval and has the mini dipper with it! My crockpot stares at me longingly when I’m on my tip toes trying to reach the pans on the top shelf, yet I reject it every time. I just need the thrill of the chase, you know? More like a Dutch oven with a few hot spots that requires some effort to coax out the flavor. I need it, well…to be a little less slutty. It should work a little harder for my love; it’s too easy. All the slow cooker has going for it is the ability to cook foods to mush. Don’t get me wrong, I use the slow cooker to make cranberry butter, creme brulee, and bread pudding. These foods benefit from a low and slow cooking environment. They’re one notch above ‘mush,’ in a good way. But, apple butter is supposed to be mushy, because it’s apples cooked beyond their breaking point, stirred with sugar and spices. It’s begging to be made in the slow cooker, so, grab a 3-pound bag and get to work! This is a small batch apple butter recipe that makes 2 pints, or 4 half pints. It’s just enough apple butter to enjoy (and not get sick of), plus a jar for a friend. I’ve been stirring it into Camille’s yogurt and topping my bagel with it, too. I made it with half honey, and I love it that way, but I wanted to let you know I’ve made all-honey versions (for Camille, of course) and all-sugar versions, too. I try to keep Camille’s sugar consumption on the natural side of things. I’ll keep doing this as long as I can, but she has enjoyed a few bites of my all-sugar version a time or two. I should also mention this is a good place to sub apple pie spice (or even pumpkin pie spice!) if you have it. Any and all warm spices are welcome here. Don’t miss my recipe for a small apple butter cake that is made in a bread loaf pan. 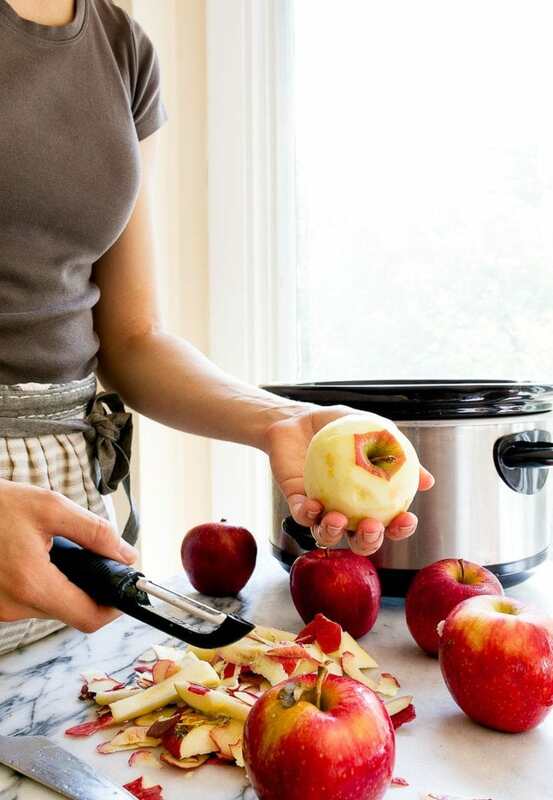 This slow cooker apple butter recipe is very welcome in that cake! I hope you enjoy the how-to video for this recipe, and let me know if you have any questions. If you’re viewing on mobile, the video is at the top of the post; if you’re viewing on Desktop, it’s to the right of the page. 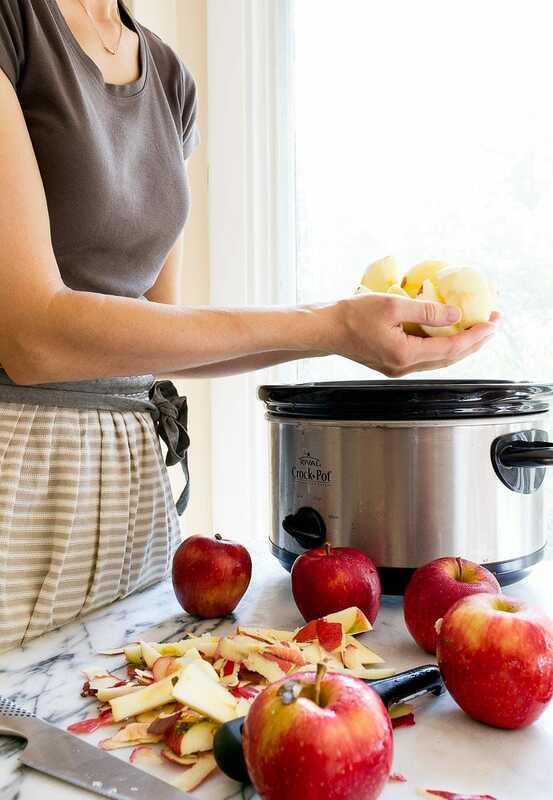 Slow cooker apple butter, small batch style. Recipe makes just 2 pints of apple butter. Peel, core and roughly chop the apples. In the bottom of a slow cooker with a capacity of at least 2 quarts, stir together the honey, sugar, and spices. Add the apples, and stir to coat. Cook on LOW for 6-7 hours. Remove the lid, and stir until the apple fall apart. Continue cooking with the lid off for 30-60 minutes, until the apple butter thickens slightly. Store covered in the fridge for up to 3 weeks. *Feel free to substitute 1 1/2 teaspoons of apple pie spice for all of the spices called for in the recipe. This looks great! Any idea on how long I could store this sealed in small mason jars after cooling it? I’ve been making crock pot apple butter for years~ I seal the jars and keep them in an extra refrigerator –sometimes for over a year. I think with care ( and maybe plastic storage containers,?) you could also freeze it with no problems. Colette, do you do a hot water bath when you seal the apple butter? No. But I do seal with a *boiled* flat lid. And I seal when the apple butter is very hot, and then I also store on an extra refrigerator after cooling/sealing on the counter. In addition, I use very little sugar ( 1/8 to 1/4 cup). I like very tart apple butter and I think the apples usually are sweet enough themselves! Does it have to be refrigerated once sealed. I have some that I keep on my pantry. Never had a problem. Just want to make sure of the reasoning behind refrigeration. My recipe is similar. I use Brown sugar. No honey. So do you only use 1/8-1/4 of sugar or no other sweetener? I’d prefer a more tart apple butter. Honestly, I may substitute sugar with brown sugar or honey. I adore anything with apple and cinnamon together. Such a great combination. I love the idea of having this in my fridge for 3 weeks but I can’t imagine there would be any left by then! Glad to have found your site. Have lots of extra apples to use this year & was thrilled to have found a way to make apple butter in a crock pot. This is an easy recipe & was nice someone else ask about canning it. But with it cooked & canned in bottles it should be good for putting on a shelf I would think. I do everything pretty much open kettle & so long as your bottles are clean I can the old fashion way which works for me except of course things that have to be pressure cooked. This recipe looks amazing, love this time of year. On a side note, I also love your apron, may I ask where you got it? Thanks! “I need it to be a little less slutty” – and this is why I love you. 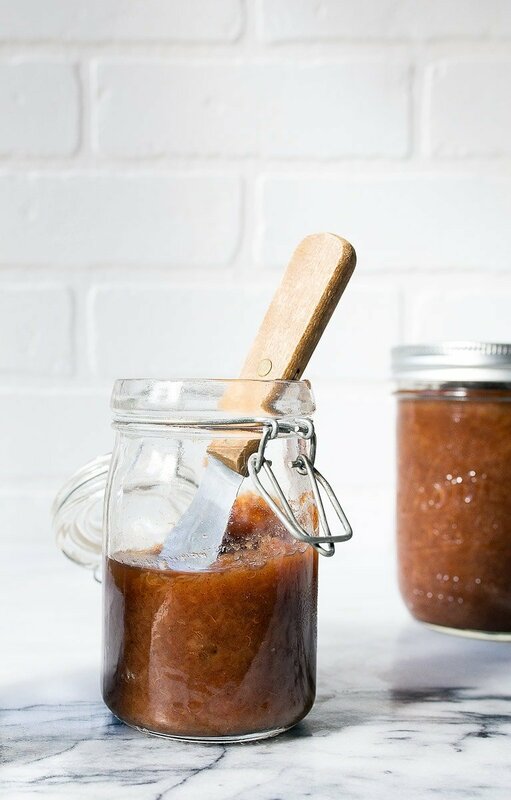 Seriously though, my dad made apple butter once when I was a kid and I always swear I’ll make it myself…but never do, so this is just the kick I need to finally do it! Now I need to buy a slow cooker. Because, yes! It does make food taste different! I’ve never made my own apple butter before, but I really must learn to do it. Thanks for sharing the recipe. I laughed at your slow cooker needing to be less slutty!! Does anyone have a vegan sub for honey? I was thinking coconut nectar since I don’t use agave. Hi Holly! I LOVE suggestions–thank you! I don’t have a slow cooker, so how can I make this? Regular pan on the stove, stir frequently…about 8 hours? Mine came out tasting fantastic but a little thin on the consistency, any suggestions?! I would continue to cook it with the lid off to evaporate some liquid. Can this be canned? I was hoping to send a jar to my sister out of state. How would I do that safely? I haven’t tried canning it, but I think someone mentioned in the comments that they did? If you were doing all sugar, how much would you use? Happy to have discovered your site! I’d love to make this recipe for neighborhood gifts. Can it be doubled? Thanks! I love apple butter so I thought it was about time I made it myself. I followed your recipe and it is delicious. So glad I finally made it at home. Sometimes I plan on making things but it just takes me forever to get around to it. Now that I’ve made it once I’ll keep making it again sometime in the near future. Thanks so much for letting me know, Didi! I’m so glad you liked it :) <3 happy fall! 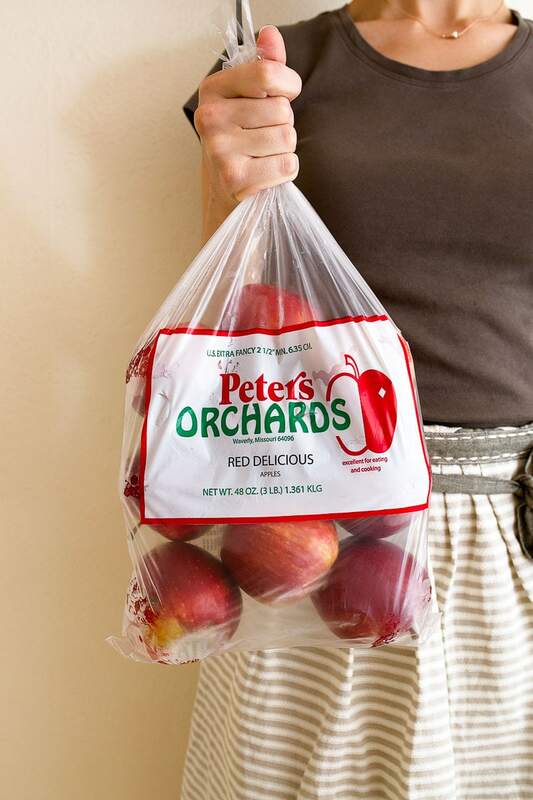 Just curious what is your favorite Apple type to use? Do you think that there is one specific apple that makes better apple butter? Just wondering! I usually do a mix :) For the video, I happened to have a bag of the same variety, and it was good, too! Any thoughts on updating this to an instant pot? Could you use cinnamon candies instead of the regular cinnamon in the recipe? If so how much? I haven’t tried that, I’m sorry. I am in the middle of making this recipe and am stuck. Is it 3# apples before coring and peeling? I weighed mine after and am afraid I don’t have enough spices in it. Help!